Orre-what? It’s a mechanical device whose resulting motions follow the orbital paths of our solar system’s heavenly bodies. Seen below is the finished project of Make enthusiast Guy Himber who confesses his inspiration was the movie Dark Crystal. (A one of a kind classic, in our opinion.) Of course, anyone who’s ever gazed at a map of our solar system is aware the planets are off—that’s cos they’re made up for convenience’s sake. 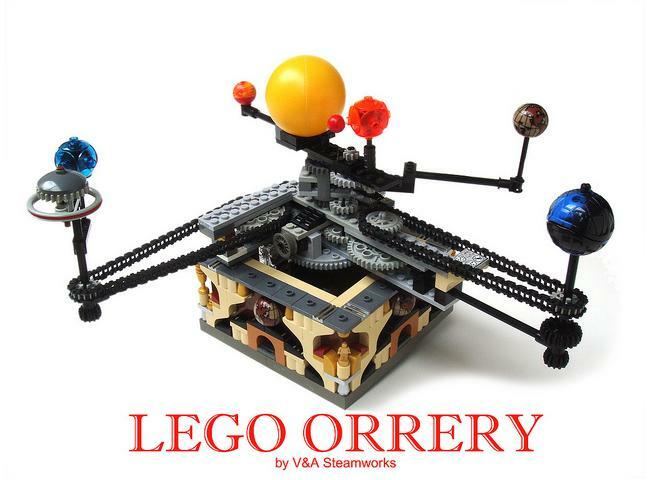 The orrery down south is a contender in a Lego competition and is in the running as a crowd favorite. Not a big problem anyway since orerry’s, by definition, follow a heliocentric model and only charts the relative position of the planets. So there’s ample room for artistic license. The maker Guy Himber works under his self-made V&A Steamworks project, which is a Lego driven building initiative that’s the fount and platform of all his creations. Check his Flickr page for more than few impressive Lego builds. After a few minutes of clickity-click research online, it turns out Mr. Guy Himber does special effects for a living and is susceptible to tinkering with small toys.